31 Dec 17: The latest version (3.4.4) of the free FISTS Log Converter program for Windows is now available. This version adds support for the 2018 FISTS Europe Ladder. The program is available from the download web page. Many thanks to the testers: Alex PA1FOX, Peter G4LHI, and Richard G0ILN. 23 Dec 17: Why not join in the very last ever session of the FISTS Americas Cumulatives on Sunday 24 December 2000-2200 UTC? This is a friendly activity where you have QSOs of at least 5 minutes and in addition to the basic information (see below), you can exchange whatever else you like: details of equipment, key, antenna, WX, etc. Vibroplex "Bug" Keys will be awarded in January 2018 to 1st, 2nd, & 3rd place operators. See the full details on the website. Have a Happy Christmas and all the very best for the New Year from all at FISTS CW Club. 22 Dec 17: How about having a short break from the Christmas/New Year festivities and join us in the final 2017 FISTS CW Club Europe on-air activities? Ladder Sunday 24 December 1400-1600 & 1800-2000 UTC. The idea is absolutely NOT a contest but a means of enabling us to meet each other on air. Operation is on 160m, 80m, 40m, 20m, 15m, & 10m. Calling 'CQ FISTS' on or around the FISTS centre of activity frequencies is recommended. Note: the Ladder will start afresh in January 2018 and details of a new set of Day-hopper sessions and other 2018 Activities will be announced later. 18 Dec 17: The FISTS CW Club Europe BrassPounder December 2017 newsletter has just been published by David G4YVM, Activities Manager. This edition includes details of the November 2017 Ladder results. 09 Dec 17: The December 2017 Cumulatives Report from FISTS CW Club Americas has been published by Dennis K6DF. This newsletter contains the results and soapbox comments for the November 2017 Cumulatives on-air sessions. 06 Dec 17: The penultimate session of the FISTS Americas Cumulatives is on Sunday 10 December 2000-2200 UTC. This is a relaxed activity with minimum 5 minute QSOs. Even if you don't want to send an entry in - and we hope you will - you can come along for some friendly QSOs and perhaps earn points towards FISTS Awards. Vibroplex "Bug" Keys will be awarded to 1st, 2nd, & 3rd place operators at the end of the year! Ladder Sunday 10 December 1400-1600 & 1800-2000 UTC. Straight Key Week finishes on Saturday 09 December, 2200 UTC. DON'T FORGET to add SKW to your logbook's Comment (or similar) field and that this year operating times are 1 hour periods starting at the following UTC times: 0000, 0300, 0600, 0900, 1200, 1500, 1800, & 2100. QSOs are friendly and conversational. Submitting logs is not essential but very much appreciated. Members from all FISTS Chapters are encouraged to join in; QSOs do not have to be with FISTS members. 02 Dec 17: Straight Key Week, one of the most popular FISTS CW Club Europe Activities, starts on Sunday 03 December and finishes on Saturday 09 December UTC. Cumulatives (FISTS CW Club Americas) no later than 7 December. Ladder (FISTS CW Club Europe) no later than 7 December. Even if you only had one QSO or feel that you won't be highly placed, please do send in logs to encourage others to join in. Ladder Sunday 26 November 1400-1600 & 1800-2000 UTC. 25 Nov 17: The next 2017 session of the FISTS Americas Cumulatives is on Sunday 26 November 2000-2200 UTC (**note time change**). 21 Nov 17: The latest version (3.4.2) of the free FISTS Log Converter program for Windows is now available. This version adds support for the 2017 Straight Key Week (Sunday 03 - Saturday 09 December, FISTS CW Club Europe). 15 Nov 17: The FISTS CW Club Europe BrassPounder November 2017 newsletter has just been published by David G4YVM, Activities Manager. This edition includes details of the October 2017 Ladder results. 14 Nov 17: The November 2017 Cumulatives Report from FISTS CW Club Americas has been published by Dennis K6DF. This newsletter contains the results and soapbox comments for the October 2017 Cumulatives on-air sessions. 12 Nov 17: The next 2017 session of the FISTS Americas Cumulatives is on Sunday 12 November 2000-2200 UTC (**note time change**). Ladder Sunday 12 November 1400-1600 & 1800-2000 UTC. 03 Nov 17: The RSGB Marconi CW 2m Contest is this coming Weekend, 4 November 1400 UTC - 5 November 1400 UTC. It is part of a Europe-wide contest and is the third out of three annual RSGB VHF CW contests (6m, 4m and 2m). Unlike HF contests, QSOs are a bit more relaxed and don't expect to get 599 for each QSO! The exchange is RST, serial number and 6 character locator. Most activity centres around 144.050, with the primary CW band plan segment 144.025 - 144.110 MHz. Cumulatives (FISTS CW Club Americas) no later than 7 November. Ladder (FISTS CW Club Europe) no later than 7 November. 22 Oct 17: The next 2017 session of the FISTS Americas Cumulatives is on Sunday 22 October 1900-2100 UTC. Ladder Sunday 22 October 1400-1600 & 1800-2000 UTC. 13 Oct 17: The FISTS CW Club Americas Fall Unlimited Speed Sprint takes place on Saturday 14 October 1700-2100 UTC on 80m, 40m, 20m, 15m & 10m. 10 Oct 17: The October 2017 Cumulatives Report from FISTS CW Club Americas has been published by Dennis K6DF. This newsletter contains the results and soapbox comments for the September 2017 Cumulatives on-air sessions. 10 Oct 17: The FISTS BrassPounder October 2017 newsletter has just been published by David G4YVM, Activities Manager. This edition includes details of the September 2017 Ladder results. Ladder Sunday 8 October 1400-1600 & 1800-2000 UTC. 07 Oct 17: The next 2017 session of the FISTS Americas Cumulatives is on Sunday 8 October 1900-2100 UTC. Cumulatives (FISTS CW Club Americas) no later than 7 October. Ladder (FISTS CW Club Europe) no later than 7 October. The idea is absolutely NOT a contest but a means of enabling us to meet each other on air. Operation is on 160m, 80m, 40m, 20m, 15m, & 10m. Calling 'CQ FISTS' on or around the FISTS centre of activity frequencies is recommended. Members can submit reports of numbers worked, soap-box comments etc. etc. as a "Round-up news" at the end of the sessions (by the end of January 2018, please), and also send any questions, to: . 23 Sep 17: The next 2017 session of the FISTS Americas Cumulatives is on Sunday 24 September 1900-2100 UTC. 23 Sep 17: Please join us in the FISTS CW Club Europe Ladder sessions: Sunday 24 September 1400-1600 & 1800-2000 UTC. 15 Sep 17: The FISTS BrassPounder September 2017 newsletter has just been published. This edition includes details of the August 2017 Ladder results. David G4YVM, who will be Activities Manager. Ian G4MLW, who will be dealing with Awards Printing and Distribution. 13 Sep 17: The September 2017 Cumulatives Report from FISTS CW Club Americas has been published. This newsletter contains the results and soapbox comments for the August 2017 Cumulatives on-air sessions. 09 Sep 17: The next 2017 session of the FISTS Americas Cumulatives is on Sunday 10 September 1900-2100 UTC. 09 Sep 17: Please join us in the FISTS CW Club Europe Ladder sessions: Sunday 10 September 1400-1600 & 1800-2000 UTC. Cumulatives (FISTS CW Club Americas) no later than 7 September. Ladder (FISTS CW Club Europe) no later than 7 September. 01 Sep 17: FISTS CW Club Americas G3ZQS Memorial Straight Key Contest starts on Friday 1st September 23:00 UTC and runs until Sunday 3rd September 23:00 UTC. For N1MM contest logger users, a User Defined Contest (UDC) file is available. Go to the N1MM website, choose "FILES" then "User Defined Contests (UDC)" and look for the file G3ZQSmem.zip . A FISTS Call History File is also available. Thanks to Les G4OGB for providing the UDC file. 28 Aug 17: FISTS CW Club will be at the Telford Hamfest & G-QRP Convention 2017 (UK) on Sunday 3rd September 2017, so please come and say hello. 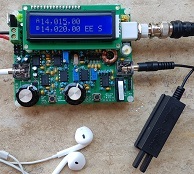 27 Aug 17: The new QCX from QRP Labs (FISTS member Hans G0UPL) is a mono-band 5W CW transceiver kit, with a along list of features including rotary-encoder-turned synthesised VFO, Iambic keyer, CW decoder, and a WSPR beacon mode. It is available in 80, 60, 40, 30, 20 and 17m options, priced only $49. The built-in test equipment (BITE) is used for aligning and debugging the transceiver, making it possible to build and adjust this radio with literally NO other test equipment! This is a kit of parts that you assemble yourself. There are NO surface mount components to solder (two SMD ICs are already factory pre-soldered). Easy to build, single-board design, 10 x 8cm, all controls are board-mounted. Professional quality double-sided, through-hole plated, silk-screen printed PCB. Choice of single band, 80, 60, 40, 30, 20 or 17m. Approximately 3-5W CW output (depending on supply voltage). Class E power amplifier, transistors run cool... even with no heatsinks. 7-element Low Pass Filter ensures regulatory compliance. CW envelope shaping to remove key clicks. High performance receiver with at least 50dB of unwanted sideband cancellation. 200Hz CW filter with no ringing. Si5351A Synthesized VFO with rotary encoder tuning. 16 x 2 blue backlight LCD screen. Iambic keyer or straight key option included in the firmware. Simple Digital Signal Processing assisted CW decoder, displayed real-time on-screen. Full or semi QSK operation using fast solid-state transmit/receive switching. Frequency presets, VFO A/B Split operation, RIT, configurable CW Offset. Configurable sidetone frequency and volume. Connectors: Power, 3.5mm keyer jack, 3.5mm stereo earphone jack, BNC RF output. Onboard microswitch can be used as a simple straight Morse key. Built-in test signal generator and alignment tools to complete simple set-up adjustments. Built-in test equipment: voltmeter, RF power meter, frequency counter, signal generator. Beacon mode, supporting automatic CW or WSPR operation. GPS interface for reference frequency calibration and time-keeping (for WSPR beacon). 26 Aug 17: The next 2017 session of the FISTS Americas Cumulatives is on Sunday 27 August 1900-2100 UTC. 26 Aug 17: Please join us in the FISTS CW Club Europe Ladder sessions: Sunday 27 August 1400-1600 & 1800-2000 UTC. FISTS CW Club Europe is pleased to announce the new Day-hopper on-air Activity, October - December 2017. Operation only on 160,80,40,20,15,10m bands. Monday October 2nd, Tuesday 10th, Wednesday 18th, Thursday 26th, Friday 27th. Wednesday November 1st, Thursday 9th, Friday 17th, Monday 20th, Tuesday 28th. Monday December 4th, Tuesday 12th, Wednesday 20th, Thursday 28th, Friday 29th. Three periods per day 08-0900, 13-1400, 18-1900 Zulu. 13 Aug 17: The next 2017 session of the FISTS Americas Cumulatives is on Sunday 13 August 1900-2100 UTC. 13 Aug 17: Please join us in the FISTS CW Club Europe Ladder sessions: Sunday 13 August 1400-1600 & 1800-2000 UTC. 12 Aug 17: The August 2017 Cumulatives Report from FISTS CW Club Americas has been published. This newsletter contains the results and soapbox comments for the July 2017 Cumulatives on-air sessions. 11 Aug 17: The FISTS BrassPounder August 2017 newsletter has just been published. This edition includes details of the July 2017 Ladder results. Cumulatives (FISTS CW Club Americas) no later than 7 August. Ladder (FISTS CW Club Europe) no later than 7 August. 21 Jul 17: The next 2017 session of the FISTS Americas Cumulatives is on Sunday 23 July 1900-2100 UTC. 21 Jul 17: Please join us in the FISTS CW Club Europe Ladder sessions: Sunday 23 July 1400-1600 & 1800-2000 UTC. 11 Jul 17: The July 2017 Cumulatives Report from FISTS CW Club Americas has been published. This newsletter contains the results and soapbox comments for the June 2017 Cumulatives on-air sessions. 08 Jul 17: The FISTS BrassPounder July 2017 newsletter has just been published. This edition includes details of the June 2017 Ladder results. 07 Jul 17: The next 2017 session of the FISTS Americas Cumulatives is on Sunday 9 July 1900-2100 UTC. 07 Jul 17: Please join us in the FISTS CW Club Europe Ladder sessions: Sunday 9 July 1400-1600 & 1800-2000 UTC. 01 Jul 17: The FISTS CW Club Americas Summer Unlimited Sprint takes place on Saturday 8 July 0000-0400 UTC on 80m, 40m, 20m, 15m & 10m. Cumulatives (FISTS CW Club Americas) no later than 7 July. Ladder (FISTS CW Club Europe) no later than 7 July. 27 Jun 17: The "summer/autumn" EuCW Snakes & Ladders run starts on Saturday 01 July and ends on 31 December UTC. For full details, please see the comprehensive rules. 27 Jun 17: The FISTS CW Club Americas Summer Slow Speed Sprint (max. 13 wpm) takes place on Saturday 1 July 0000-0400 UTC on 80m, 40m, 20m, 15m & 10m. 24 Jun 17: UK amateurs: The annual RSGB 6m CW contest is Sunday 25th June, 0900-1200 UTC. The exchange is RST, serial number and 6 character locator, with most European CW activity between 50.080-50.100 MHz. Unlike HF contests, though, don't expect to get 599 for each QSO! This should be interesting with the added likelihood of sporadic E propagation. QSOs with other FISTS CW Club members count towards FISTS Awards such as the Millionaire. 24 Jun 17: The next 2017 session of the FISTS Americas Cumulatives is on Sunday 25 June 1900-2100 UTC. 24 Jun 17: Please join us in the FISTS CW Club Europe Ladder sessions: Sunday 25 June 1400-1600 & 1800-2000 UTC. 14 Jun 17: The June 2017 Cumulatives Report from FISTS CW Club Americas has been published. This newsletter contains the results and soapbox comments for the May 2017 Cumulatives on-air sessions. 11 Jun 17: The FISTS BrassPounder June 2017 newsletter has just been published. This edition includes details of the May 2017 Ladder results. 10 Jun 17: The next 2017 session of the FISTS Americas Cumulatives is on Sunday 11 June 1900-2100 UTC. 10 Jun 17: Please join us in the FISTS CW Club Europe Ladder sessions: Sunday 11 June 1400-1600 & 1800-2000 UTC. Cumulatives (FISTS CW Club Americas) no later than 7 June. Ladder (FISTS CW Club Europe) no later than 7 June. Snakes & Ladders (EuCW) no later than 7 June. 28 May 17: The next 2017 session of the FISTS Americas Cumulatives is on Sunday 28 May 1900-2100 UTC. 28 May 17: Please join us in the FISTS CW Club Europe Ladder sessions: Sunday 28 May 1400-1600 & 1800-2000 UTC. 11 May 17: The RSGB 4m (70 MHz) CW Contest 2017 is Sunday 14 May 0900-1200 UTC. This is one of three RSGB VHF CW contests (6m, 4m, & 2m). These are more relaxed than HF contests and typically 'real' RSTs are exchanged, so have fun and listen carefully! If you have QSOs with FISTS CW Club members, these count towards the FISTS Awards. 11 May 17: The next 2017 session of the FISTS Americas Cumulatives is on Sunday 14 May 1900-2100 UTC. 11 May 17: The FISTS CW Club Americas Spring Unlimited Sprint takes place on Saturday 13 May 1700-2100 UTC on 80m, 40m, 20m, 15m & 10m. 11 May 17: Please join us in the FISTS CW Club Europe Ladder sessions: Sunday 14 May 1400-1600 & 1800-2000 UTC. 10 May 17: The May 2017 Cumulatives Report from FISTS CW Club Americas has been published. This newsletter contains the results and soapbox comments for the April 2017 Cumulatives on-air sessions. 08 May 17: The FISTS BrassPounder May 2017 newsletter has just been published. This edition includes details of the April 2017 Ladder results. 05 May 17: The FISTS CW Club Americas Spring Slow Speed Sprint (max. 13 wpm) takes place on Saturday 6 May 1700-2100 UTC on 80m, 40m, 20m, 15m & 10m. Cumulatives (FISTS CW Club Americas) no later than 7 May. Ladder (FISTS CW Club Europe) no later than 7 May. Snakes & Ladders (EuCW) no later than 7 May. QRS Week (EuCW) no later than 31 May. Even if you only had one QSO or feel that you won't be highly placed, it's desirable to send in logs to encourage others to join in. 21 Apr 17: The 2017 EuCW QRS Week activity is Monday 24 April to Friday 28 April inclusive. Maximum speed is 14 wpm. See the full details on the EuCW website. 21 Apr 17: The next 2017 session of the FISTS Americas Cumulatives is on Sunday 23 April 1900-2100 UTC. 21 Apr 17: Please join us in the FISTS CW Club Europe Ladder sessions: Sunday 23 April 1400-1600 & 1800-2000 UTC. 09 Apr 17: The April 2017 Cumulatives Report from FISTS CW Club Americas has been published. This newsletter contains the results and soapbox comments for the March 2017 Cumulatives on-air sessions. 09 Apr 17: The FISTS BrassPounder April 2017 newsletter has just been published. This edition includes details of the March 2017 Ladder results. 07 Apr 17: The next 2017 session of the FISTS Americas Cumulatives is on Sunday 9 April 1900-2100 UTC. 07 Apr 17: Please join us in the FISTS CW Club Europe Ladder sessions: Sunday 9 April 1400-1600 & 1800-2000 UTC. 05 Apr 17: FISTS CW Club will be attending the NARSA Rally at the Norbreck Exhibition Centre, Blackpool, UK on Sunday 9th April 2017. We're on stand 34, which is in the main hall. This is a lively event with a wide range of club and trade stands - well worth a visit. The doors open at 10:30 BST and maps etc. are available on the NARSA website. Cumulatives (FISTS CW Club Americas). Ladder (FISTS CW Club Europe). Even if you only had one QSO or feel that you can't win, it's desirable to send in logs to encourage others to join in. 26 Mar 17: Please join us in the FISTS CW Club Europe Ladder sessions: Sunday 26 March 1400-1600 & 1800-2000 UTC. 26 Mar 17: The next 2017 session of the FISTS Americas Cumulatives is on Sunday 26 March 1900-2100 UTC (*Note* the change in times!). 10 Mar 17: The next 2017 session of the FISTS Americas Cumulatives is on Sunday 12 March 1900-2100 UTC (*Note* the change in times!). 10 Mar 17: Please join us in the FISTS CW Club Europe Ladder sessions: Sunday 12 March 1400-1600 & 1800-2000 UTC. 09 Mar 17: The March 2017 Cumulatives Report from FISTS CW Club Americas has been published. This newsletter contains the results and soapbox comments for the February 2017 Cumulatives on-air sessions. 08 Mar 17: The FISTS BrassPounder March 2017 newsletter has just been published. This edition includes details of the February 2017 Ladder results. 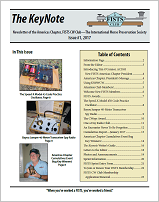 28 Feb 17: The new FISTS CW Club Americas KeyNote newsletter Issue 1, 2017 is ready to download for all current FISTS members. Introducing Tim O'Connor, AC5SH, new FISTS Americas Chapter President. The Speed-X Model 450 Code Practice Oscillator. Bayou Jumper 40-Meter Transceiver Spy Radio. One a Day Radio Club. An Encounter Never To Be Forgotten. Americas Chapter Cumulatives Event Bug Key Winners! 25 Feb 17: KN0WCW/5, the FISTS USA club call, will be active during the next 2017 session of the FISTS Americas Cumulatives on Sunday 26 February 2000-2200 UTC. Vibroplex bug key prizes will be awarded to the top 3 entrants at the end of the year! 13 Feb 17: The February 2017 Cumulatives Report from FISTS CW Club Americas has been published. This newsletter contains the results and soapbox comments for the January 2017 Cumulatives on-air sessions. 12 Feb 17: The FISTS BrassPounder February 2017 newsletter has just been published. This edition includes details of the January 2017 Ladder results. 10 Feb 17: KN0WCW/5, the FISTS USA club call, will be active during the next 2017 session of the FISTS Americas Cumulatives on Sunday 11 February 2000-2200 UTC. 10 Feb 17: The FISTS CW Club Americas Winter Unlimited Sprint takes place on Saturday 11 February 1700-2100 UTC on 80m, 40m, 20m, 15m & 10m. 10 Feb 17: Please join us in the FISTS CW Club Europe Ladder sessions: Sunday 12 February 1400-1600 & 1800-2000 UTC. 02 Feb 17: Please submit your January logs for the FISTS CW Club Americas Cumulatives by the end of February 7th. Ladder (FISTS CW Club Eu). 02 Feb 17: The FISTS CW Club Americas Winter Slow Speed Sprint (max. 13 wpm) takes place on Saturday 4 February 1700-2100 UTC on 80m, 40m, 20m, 15m & 10m. 21 Jan 17: Please join us in the second 2017 FISTS CW Club Europe Ladder sessions: Sunday 22 January 1400-1600 & 1800-2000 UTC. 21 Jan 17: The second 2017 session of the FISTS Americas Cumulatives is on Sunday 22 January 2000-2200 UTC. 16 Jan 17: The FISTS BrassPounder January 2017 newsletter has just been published. This edition includes details of the Straight Key Week 2016 results and final 2016 Ladder results. 15 Jan 17: The Vibroplex Bug Key Winners for 2016 have been announced in the FISTS CW Club Americas Cumulatives Report for January 2017. This newsletter contains the final results and soapbox comments for the 2016 FISTS Americas Cumulatives on-air activity and dates for the new 2017 activity sessions. 07 Jan 17: Please join us in the first 2017 FISTS CW Club Europe Ladder sessions: Sunday 8 January 1400-1600 & 1800-2000 UTC. 05 Jan 17: The first 2017 session of the FISTS Americas Cumulatives is on Sunday 8 January 2000-2200 UTC. Bug key prizes will be awarded to the top 3 entrants at the end of the year! See the full details on the website. The free FISTS Log Converter program for Windows version 3.4.0 or later can be used to create and submit logs at the end of each month. Select the "Activities" tab, then the month, and then "Cumulatives". Ladder (FISTS CW Club Eu) no later than 5 January. Snakes & Ladders (EuCW) no later than 7 January. 01 Jan 17: Please submit your December logs for the FISTS CW Club Americas Cumulatives by the end of January 7th (ignore any warnings about late entries from FISTS Log Converter). 01 Jan 17: The "winter/spring" EuCW Snakes & Ladders run starts today Sunday 01 January and ends on 30 June UTC. Have a very Happy New Year from all at FISTS CW Club.